The Chinese New Year, which began this year on January 28th, is a big deal in Sydney, which has a large and vibrant Chinese community, some of whose families go back to the gold rush days of the 1850s. 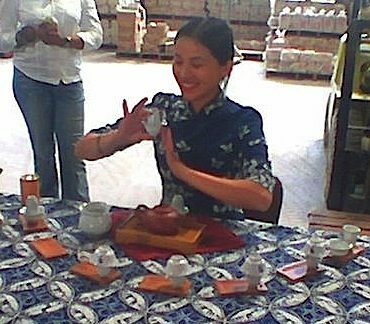 As part of the celebrations, the Art Gallery of New South Wales hosted a demonstration of the traditional Chinese tea ceremony. The ceremony predates its better-known Japanese cousin, and goes back to the 9th century. By pure chance, I was in the gallery when the demonstration took place. The cultural aspects were fascinating in themselves, but what really caught my eye was the science. Not that science was directly mentioned. But it was there all right, just as it was when chef Fritz Blank produced a tasting guide for his restaurant describing the best way to eat smoked salmon. Together we turned his guide into a talk at the 2001 Oxford Symposium on Food and Cookery, where we had the audience, each with their own supply of smoked salmon, bread, butter and lemon, following the guide while I described the science behind each step. It occurred to me as I watched the tea ceremony that I could do something similar for tea tasting. Luckily, I had my camera with me. I couldn’t photograph the actual demonstrations in the low light and with people’s heads in the way, but I could photograph the slides (albeit slightly from the side!). Organizer Shane Shu from the Topotea Company, which sponsored the event, kindly gave me permission to post my photographs here. So here they are, with my brief comments. One day I might expand them in to a full article, but at the moment I am striking while the iron (or tea) is still hot. As with any other aspect of experimental science (within which I include cookery) careful measurement is crucial, both for comparing the effects of change and for reproducing the result! since it requires water to be near boiling temperature to release the essential oils from the tea leaves, and a cold teapot will reduce the temperature. Incidentally, the use of boiling water to release essential oils is not confined to tea – it is used in the laboratory, and on an industrial scale, in the process of steal distillation. This is where my scientific mind started to buzz, because rinsing the leaves is something that we don’t usually do when we make our morning cuppa, and I wondered just what its function was. I don’t actually believe that its purpose is simply to expand the leaves – just immersing them in boiling water will do that. I can see, however, that rinsing will remove any residual dust and dirt, and leave the tea clearer and visually more attractive. Scientifically, a great idea! Vigorous stirring will not only release flavours; it will also help to break up the oils (which are not soluble in water) into tiny droplets that will remain in suspension as a micro-emulsion during the life of the tea. The smaller the droplets, the clearer the tea. Diffusion is a slow process, even from the centre of a single tealeaf to the outside. Minutes are required for the material from the centre of the leaf to reach the outside and contribute to the flavour. All of the tea is then strained in to a single mug. Here we can see the benefits of that initial quick wash. Tea leaves remain in the strainer, but tiny dust and dirt particles would have passed through had they not first been removed. No scientific reason for this that I can see. It is purely cultural, and presumably related to the metaphorical aspects of the ceremony that are described later. But what follows is scientifically very interesting indeed! First, the tea is (counterintuitively) poured into the “fragrance cup”. The this is covered with the “tasting cup”, and the combination is turned upside-down! The process of savouring the aroma prepares the brain for what is to come; a culmination of the rising expectations that the previous steps have engendered. Just as much of science is an art form – a way of seeing and understanding ourselves and the world around us. Conclusion: There is much more to tea than meets the eye!